I am happy to see that more and more people are looking at Thoroughbreds for pleasure, eventing, and pasture partners. However, I have also seen quite a few people jump into something that they are not prepared for and this article is intended as a starting point so that you don’t bite off more than you can chew by buying or adopting a horse right off the track with no plan behind you. Understand that your OTTB (unless they’ve been off for months) will need down time. They don’t know how to be anything other than a racehorse, and if you immediately jump into re-training, you’re in line for a disaster. BUDGET. BUDGET. BUDGET. And not just for the purchase and boarding of your horse. Just because you got a new family member doesn’t mean that the rest of your bills will pay themselves or that they’ll stop coming. Plan accordingly for this because you could get yourself in real trouble before you even get going. Don’t go crazy buying super fancy tack right off the bat; nine times out of ten, your OTTB will trash them as they transition into their new jobs. Get the basic stuff first that fits and is comfortable: fancy can come later once they aren’t trying to rip your arms out at a trot. Arrange with your boarding barn and veterinarian ahead of time. Nothing is more annoying or frustrating for either party than when an owner suddenly dumps the news on them that a new horse will be coming into their care. No prior notice, no message, nothing. This will make you public enemy number one very quickly. And we shall now expand on the general points! Point 1: Almost all off-track thoroughbreds that are purchased directly from a trainer or owner will be coming fresh off the track and will still be in racing shape. Take this into account as you shop around your favorite OTTB retirement and re-homing websites like CANTER; this will also bleed into budgeting as well. Understand that, when the trainer tells you that the horse will need more time before he’s ready for new training, that means that you’ll have to be patient as the horse heals and recovers from whatever ailed him. Now, just because the horse has an injury/particular vice, that doesn’t mean that he can’t become the perfect partner in time. His price will reflect the ailment, and if the trainer is strict when he says “no high level (insert sport)” than they are being serious. Please don’t be that buyer that ends up catastrophically injuring a horse because you “knew” better than the trainer and his veterinarian. It is a delicate relationship that organizations like CANTER have with the horsemen, and these trainers love their horses. If they found out that you did something against better judgement and that the horse had to be put down, they will likely stop posting available horses on a safe site like CANTER and turn to places that are frequently creeped by kill-buyers; Craigslist and some equine listing sites have this problem. Respect the horse(wo)men, please. Point 2: BUDGET. BUDGET. BUDGET. I am saying this again because it is worth repeating. There are enough poor backyard breeders that send horses to slaughter over a lack of funds; please be a smart owner and be prepared with auxiliary money for everything and anything that could happen. Am I saying that you need to have seven zeros to the right of your bank account? No. But please do not budget away $2,000 to buy a horse, and then have nothing to pay your personal bills and the bills that your horse will accrue upon arrival or during travel. Now, the “basics” tab is a little high because this is assuming that you have NO horse equipment at all and that you have to buy everything from scratch; if this isn’t your first rodeo, this will be much lower for you. 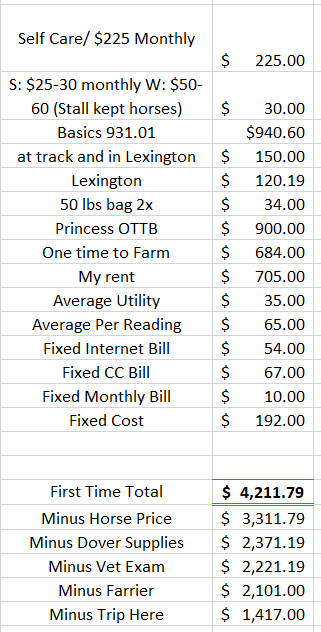 Now, this list is based on some of my personal expenses; you may have cheaper rent or mortgage, but you have to list everything out like this in order for you to understand just how much money you will need for that first month. It gets easier once all the “one time purchases” like the vet check, farrier, basic supplies for the horse (you’d be surprised how many people buy a horse and then forget basic things like food and a halter), the horse’s price tag, and the trip to you (if he’s in another state) are taken out. Use whatever terminology works best for you in helping you understand your worksheet; this is your work after all. Now, if you are head-over-heals in love with a particular horse, and he’s a little more heavily injured than most that are up on a site like CANTER, than you also have to budget your expected veterinary costs MUCH higher over the course of the next few months. Be prepared to buy some pretty expensive medication, and having to buy it frequently. If you can’t (or don’t want) to spend that kind of money, get another horse or don’t buy one at all. Owning a horse isn’t a hobby and it isn’t cheap either; it can be but you need to plan like it won’t be. It’s okay to be a pessimist in these kinds of situations: be prepared for injuries that may never come but ones that you’ll be able to tackle if/when they do occur. Point 3: Do not drive yourself into bankruptcy buying a $6,000 custom-fit saddle, $400 European leather bridle, and $300 in other various tack for a horse that will have no clue how to not bolt with you on his back for the first couple of months. As they begin to use other muscles in their body, their conformation and shape will change. If you go crazy buying all of this expensive stuff, you will be more than disappointed when it no longer fits him one day after he starts training in another career path. Buy cheap and comfortable until his body reaches a point where it will be more consistent in its shape and movements. Make sure that you take all the necessary precautions when it comes to fitting saddles, bits, and bridles. Do not eyeball anything. You are not baking a cake; you are entrusting your life to the tack that is keeping your half-ton horse in check and under control. This needs to be as exact as possible. If this is your first time owning a horse, please research a local and reputable trainer. They can help you get started, and will be a mentor for you as you learn the ropes. Thoroughbreds can be a very hard breed to ride, much less train, if you’ve never experienced one before buying him. 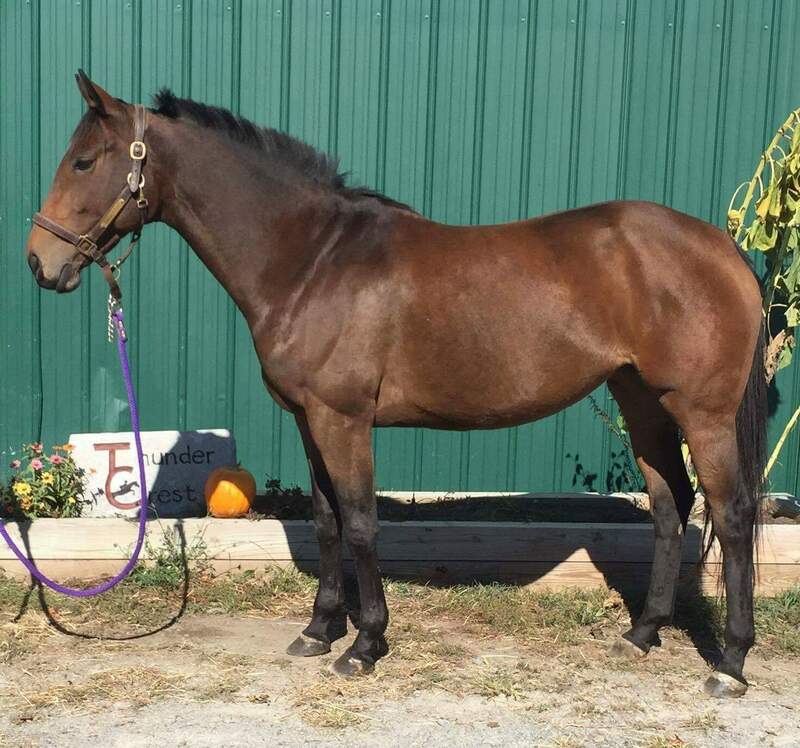 If this is your first Thoroughbred, please also do some research on the breed and how people have retrained their OTTBs. This is not going to be like training every other horse for some people, and if you have trouble with a 15 hand Quarter Horse that’s almost always half-asleep, good luck training a 16.2 hand racehorse that is strong and fresh, on your own. Don’t get yourself or the horse or both of you injured because your pride won’t let you admit that you need help. It’s okay to have a second set of eyes to track your progress and help you when you’re stuck. Point 4: Do not assume that boarding barns will drop everything they’re doing and will clear a stall out for your horse if you let them know that he’s coming three days prior. Some barns will require a minimum week notice, and others may ask for even longer. Research the farm, contact them, and let them know that you are wanting to board with them. Tell them as much about your horse’s vices/quirks as possible so that they can accommodate as best they can and make sure you have all of your horse’s paperwork immediately available for them to see. Many places will not even let your horse on site if you can’t prove vaccination records and ownership papers. Let them know what company will be hauling your horse so that the farm manager doesn’t suddenly have a random horse and van in her yard with no clue as to whom they are there for. Never assume that there will always be a spot for your horse. Always contact farms ahead of time and before your horse ships out to his new home and make sure that they have room. There is no worse feeling than having your horse be four hours out from his new home and you not having anywhere for him to stay. Spaces fill up quick but they also become available just as quickly. While one farm may not have any space, another may become your saving grace. Communication is key here. The same goes for your veterinarian. Always make sure that you get the records from the previous owner/trainer, and all scans that their vet may have done on the horse. Send them to your veterinarian of choice and let them give you a second opinion before you even purchase the animal. Make sure that this paperwork gets to them long in advance; do not send them to the vet and ask for an “emergency consultation” because you’ve already bought “Ranger” and he’s going to be there in a couple hours. Not only are you gambling with your money, but you’re also potentially forcing your vet’s hand into a situation that they don’t want to be in. This does not reflect well down the line when you will want a favor from them, a recommendation for a specialist, or beg for a reduction on their bill because you’re in tough times. Be nice and respectful of the person that keeps your horse healthy and happy. Now, those are just the very bare basics. The most important thing is to never rush head-long into the purchase if you are not comfortable with what you are seeing from the horse. Listen to your gut if it is screaming at you that something is wrong; get a second and even a third opinion before buying an OTTB for any amount of money. If the price is very low, find out why. If they are demanding a princely price, make sure that the horse is living up to that tag 100% and that they aren’t gouging you with a horse that’s not even worth half the asking price. Most importantly, you are allowed to say no. Don’t feel pressured into the horse via a sob story or threats of slaughter. If that does come out of the trainer/owner/groom’s mouth, immediately report the behavior to the track and have them investigate. It is against Jockey Club rules for them to sell their horse to a kill-buyer, so do not let them scare you into thinking that the pen is the horse’s next stop. However, most horsemen are honest people and just want their horse to make it into a great home. Respect their wishes for the horse, respect their rules in their barn, and make sure that you don’t step on any toes while you’re inspecting the horse. Get ready to own a toddler that wants to do everything you say, but mentally can’t. Have A LOT of patience. Don’t expect a lot, don’t buy off of looks or pedigree. 90% [of the time] none of it matters. Buy off of temperament, and talk to the grooms about the personality. Also, don’t overlook small things like osselets or old bow tendons that they are sound on; check out the horse. Ex: Simon has osselets and obviously a bum leg, [but she] will still be sound for what I want to do with her. Also remember how they are trained: it takes them a while to re-learn how to use themselves for any other discipline. If you plan thoroughly enough, you can get the best horse you’ve ever owned for a very fair price. You just have to make sure that you’re prepared for the extra dent into your income and time. If you are, you’ll find that OTTBs are incredible animals, athletes, and best friends.